They were teenage sweethearts… Can they say “I do” a second time? Abigail last saw her ex-husband, Brad, six years ago, but now that they’re reunited at his sister’s wedding, their chemistry makes her feel like a love-struck teenager again! 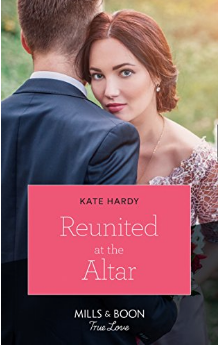 Neither has forgotten the tragedy that tore them apart, but as Brad walks his sister down the aisle, all the romance in the air makes Abby wonder, could she and Brad find themselves at the altar…again? The book’s set in my favourite part of the world – the North Norfolk coast. (Great Crowmell – it’s a mash-up of Cromer and Wells-next-the-Sea.) Abigail has taken over the running of her family’s beachside cafe – but she’s also expanded the business to ice cream. Including ice cream for dogs. (Archie was my chief research assistant for this one and enjoyed a run on the beach and then tasting things for me.) I’ve borrowed bits of the local medieval churches (the graffiti is *really* interesting), the seals (always a joy), and… Oh, just come and visit Norfolk. It’s wonderful. Brad and Abigail loved each other deeply, but circumstances tore them apart. Now they have a chance to see if the sparks between them can grow back into a real relationship – if both of them can learn to compromise. You’ll enjoy this if you like books with a seaside setting, small towns, ice cream, And accidental babies. And a big thanks to Lynne Connolly for suggesting the town name.